How crazy are you to have one of the most extravagant Yo-Yos on this planet? Madhouse is one of the brands that we all remember with nostalgy. These professional, virtuoso YoYo’s made in USA, changed the game radically and were different to anything we had never seen. The main Yo-Yo that caused this sensational hit was the 5150 in 2008. It can be found down below. You’ll see, an exceptional Yo-Yo that we all dream about playing with some day. 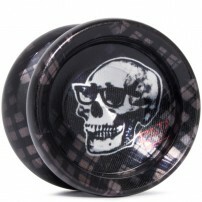 The MadHouse RAD is one of those Yo-Yos that you know you want now. Can you even think of a reason to wait?